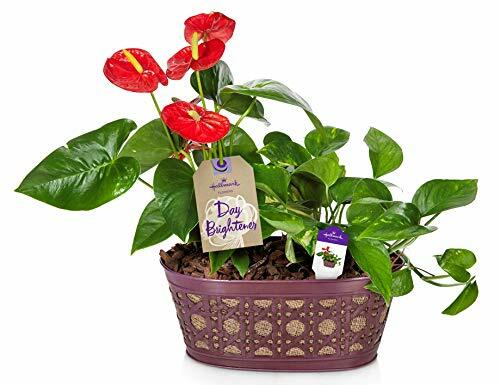 The Hallmark Flowers Happy Hearts Red Anthurium and Pothos Garden in a 10 inch purple tin container features heart-shaped glossy leaves with heart-shaped red blooms and pothos that is sure to brighten your home or office as well as help purify the air. This garden ships 100-percent in bloom with beautiful 14-18 inch tall flowers and trailing greenery for months of lasting enjoyment. To care for your anthurium and pothos garden, water thoroughly with cool water once a week and drain. Allow drying out slightly between watering's and be careful not to overwater. Place in bright, indirect sunlight at 65-85 degrees F. The Hallmark Flowers Happy Hearts Anthurium and Pothos Garden ships with advanced packaging technology to protect the plant throughout shipping. It makes a wonderful gift for any occasion and is great for hostess gifts, birthdays, and house warmings.